Put your opponent on the defensive with the classic counter-attacking weapon against 1.d4, the King’s Indian Defense – the choice of World Champions from Bobby Fischer to Garry Kasparov. In this comprehensive 9 hour Deep Dive course, GM Damian Lemos reveals all you need to know to become an expert in the King’s Indian Defense (1.d4 Nf6 2. c4 g6 3. Nc3 Bg7), demonstrating how to combat each of the main White variations in turn. The active King’s Indian Defense repertoire recommended by GM Lemos will frustrate White players used to trying their pet lines, while giving Black excellent chances to play for a win in all variations. The King’s Indian Defense is the definitive answer to 1.d4 and will serve you well for the whole of your playing career. 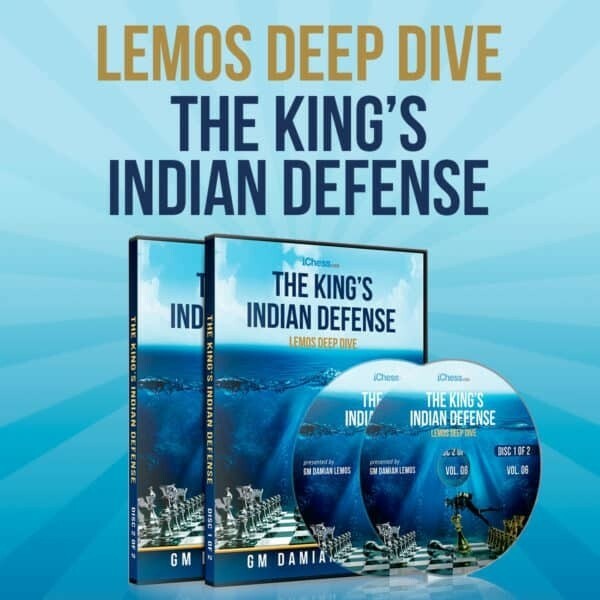 If you want an opening system that your opponents will fear and will produce attacking wins by the bucketload, master the King’s Indian Defense with GM Damian Lemos’ Deep Dive course! Take your opponent out of their comfort zone early with the Chigorin Defense, a superb counter-attacking opening that will surprise most 1.d4 players. In this 8 hour Deep Dive course, GM Damian Lemos reveals all you need to know to become an expert in the Chigorin (1.d4 d5 2.c4 Nc6! ), demonstrating how to combat each of White’s logical tries. When World Champions like Anand, Carlsen, and Kramnik are losing against an opening, you know it has bite! If you want an opening system you can call your own, one which you can lead your opponents into and then outplay them with your expertise, master the Chigorin Defense with GM Lemos’ Deep Dive course! Damian Lemos is a grandmaster from Argentina with a top rating of 2559 Elo. In his lessons, Damian works closely with students to first identify the flaws and weaknesses in their games so that they can be properly evaluated and corrected. By developing specifically-tailored training regimens for every one of his students, Grandmaster Lemos is able to achieve results that other chess coaches dream of. How is this course going to help me? Every club player knows that in the 1.d4 openings, the c-pawn should be used to attack or defend the central pawn. In this course, GM Lemos shows you how to play against the most popular variation played against the Chigorin Defense (1.d4 d5 2.c4 Cc6!) at Club Level. When playing with the Black pieces, you have the opportunity to choose the type of game you want. Why not decide for something your opponents won’t be familiar with? After d4 d5 2.c4, White is surely well prepared for 2…e6 or 2…c6. But be prepared to his open-wide eyes while you play 2….Nc6! GM Lemos shows how to play every pawn structure that arises after the Chigorin, exploring the best plans, where to move your pieces and which pieces to exchange – A must-know to improve your positional understanding too! The Chigorin is largely based on quick development, which will give you amazing tactics from the beginning of the game and big attacking opportunities in the middlegame. No matter where White Castles. This is an opening that can be learned in a weekend and that will give you lots of points during all your chess career! To help you master all content, you also get a complete .PGN database for review, high-quality PDFs and challenging puzzles.